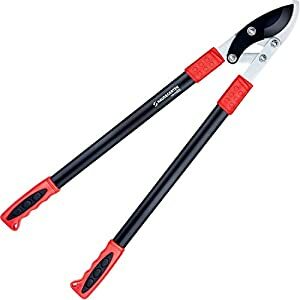 HEAVY DUTY TITANIUM CLASSIC STYLE BYPASS PRUNING SHEARS – Increased Blade Durability Razor Sharp Cutting Power Performance Tools. 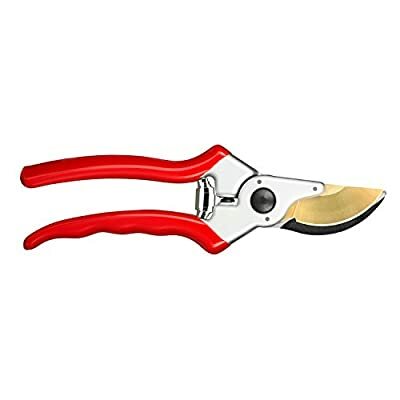 Made of High Quality Japanese Grade Stainless Steel Hardened Blades- More Durable Than Other Similar Traditional Hand Pruners – Protective Titanium coating decreases friction of trimmer & makes for easier cutting offers long-lasting protection against rust corrosion. ERGONOMICALLY ENGINEERED ANTI-SLIP RED CUSHIONED LONG HANDLE GRIP HAND PRUNERS WITH SHOCK-ABSORBING PADS – Strong Lightweight Drop Forged All Metal Aluminum Body Handle Secateurs – Pruning Snips Fit Medium to Large Hands Can Helps Reduce Repetitive Hand Motion Injuries Hand Fatigue Wrist Strain – Ideal Versatile Gardening Trimmers for General Yard Farm Work Multi-Purpose Intensive Pruning Arthritis Sufferers Carpal Tunnel Seniors with Weak Hands. Sap Grooves Prevents the Pruning Cutters From Sticking And Saves Time By Channeling Off Sap To Keep The Bypass Blades Clean Of Debris After Each Cut – Convenient Wire Cutting Notch Is Incorporated Into The Clippers To Expedite Planting And To Protect The Cutting Edge Of The Snips. 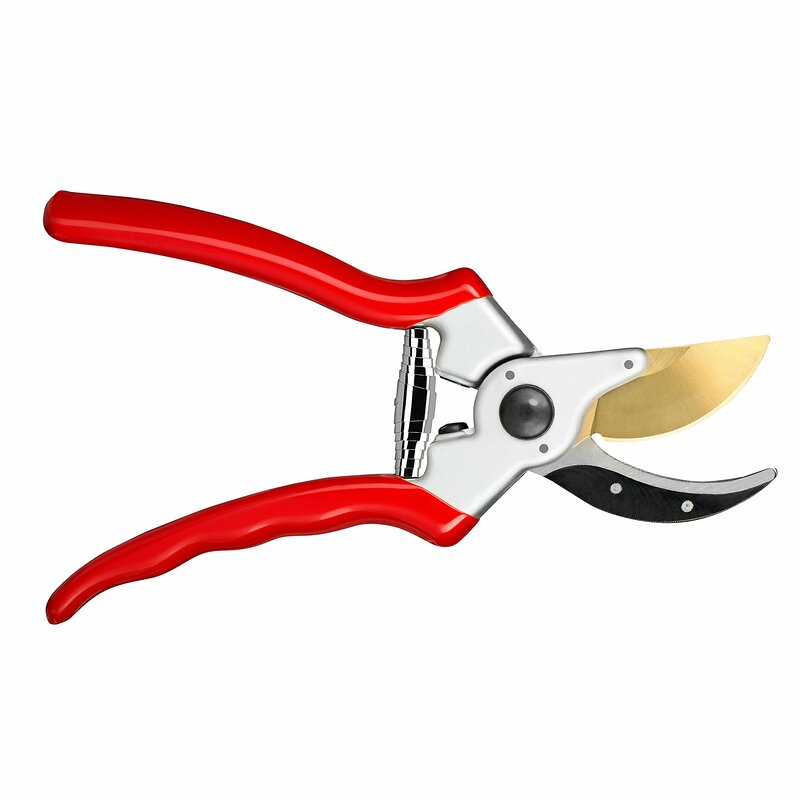 Are You Frustrated By Spending Money On So-Called “Professional” Grade Pruners That Cause You Pain, Discomfort & Make Gardening Tiresome? If So, We’d Like To Introduce You To The Haus & Garten Pruning Shears. 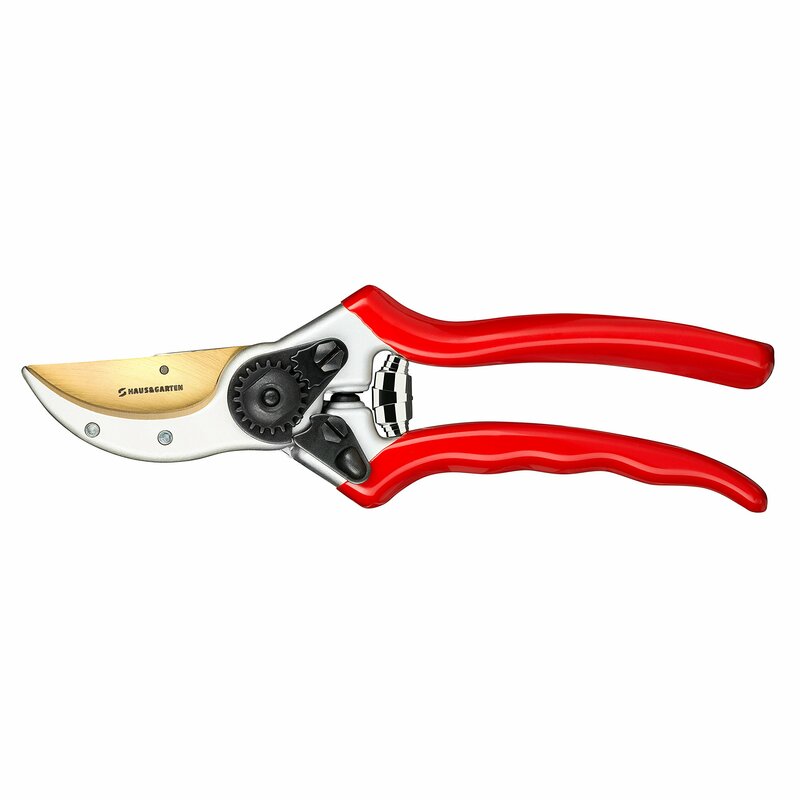 Made for Professional & Home Use These Classic Style Heavy-Duty Pruners Are The Choice for the Toughest Gardening Challenges. Built for Hard Use, These Titanium Blade Pruning Shears Have a Smooth, Precise Cutting Action & Are Designed to Deliver Maximum Force with Minimum Pressure. Strong & Powerful to Tackle Tree Branches, Shrubs, Hedges & Orchards, Whilst Still Precise Enough For The Most Delicate Pruning of Rose Stems, Bonsai, Ornamentals & Flowers. 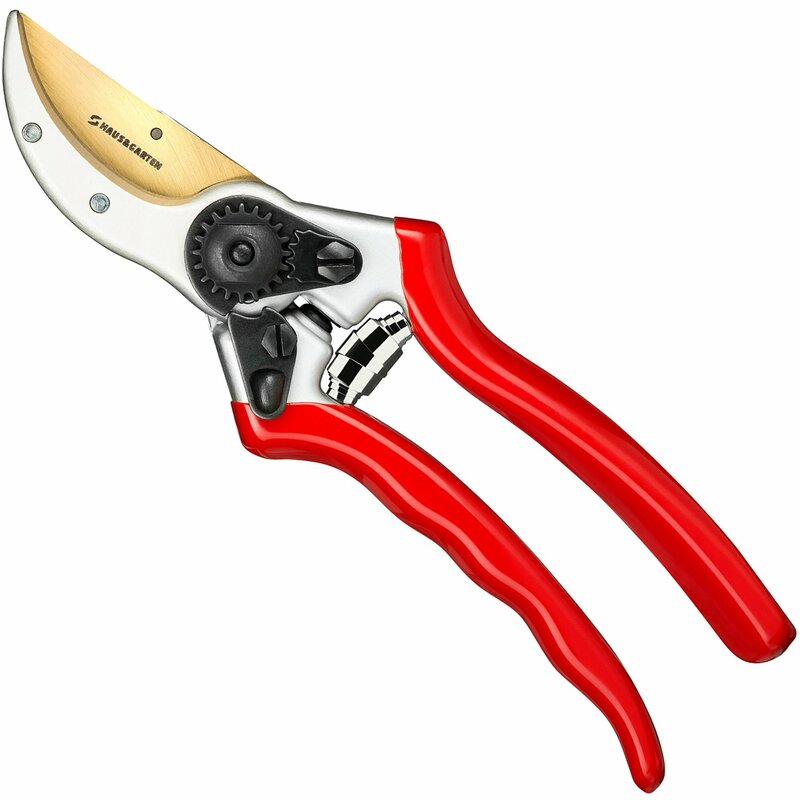 Ideal Pruner for Men, Women & Arthritis Sufferers. Drop Forged Aluminum Body & Handles. Cutting Size Diameter 1/2 – 3/4 Inch up to 1 Inch. 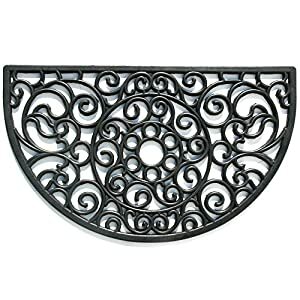 High-Tempered Carbon Steel Titanium Blade Coated for a Durable Sharper Cutting Edge. Anti-Slip Cushioned Handle Grips & Shock Absorbing Pads to Reduce Repetitive Motion Injuries & Wrist Strain. Micrometric Adjustment System Guarantees Optimal Orientation of the Cutting Edge for the Lifetime of the Tool. Deep Sap Groove Prevents Sticking & Keeps Blade Clean After Each Cut. 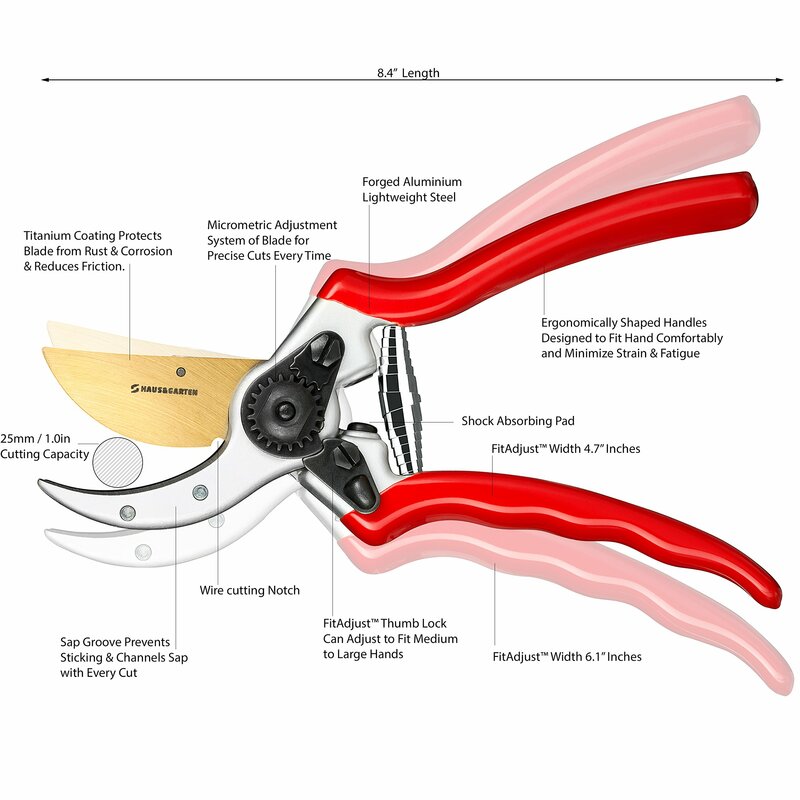 MICROMETRIC ADJUSTABLE SYSTEM Allows Manual Adjustment And Alignment Play of The Cutting Blade For Optimal Precise Clean Cuts Every Time of the Scissors – Smooth Effortless Cutting Actions Make Trimming An Easy Chore of Rose Stem Floral Plant Shaping Ornamental Flowers Vines Grape Fruit Tree Limb Branch Shrub Bush Hedge Lawn Edging Small Trees Without Much Effort. 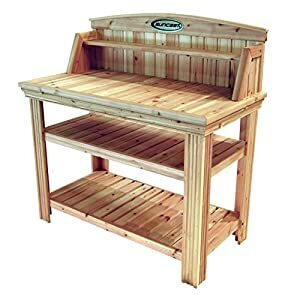 Will Cut Through 1/2′ 3/4′ 1 inch Diameter Size Branches Depending On The Wood Species. QUALITY MADE PRUNING SHEARS BACKED UP WITH A 100% CUSTOMER SATISFACTION GUARANTEE – With Personalized Customer Service We Are Here 7 Days A Week Ready To Help You Our Attention To Customers Is Unmatched!